NOTE: Reminiscing on a kitchen remodel he worked on over nine years ago, kitchen designer Randall Omoto notes that even though trends will come and go through the years, smart solutions to common problems will never go out of style. 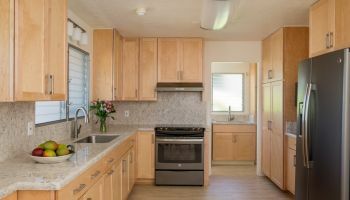 When one Oahu couple began feeling more than a little cramped within the current layout of their Aiea townhouse, the pair decided to enlist the help of local professional kitchen designers and remodelers Homeowners Design Center for their kitchen remodel, who helped them to arrive at a solution that was highly functional, much more open and also stylish. The main area of concern for the couple was the existing galley kitchen, who neither of which felt was adequate for their culinary or social hosting needs. To watch the video and hear kitchen designer Randall Omoto talk about this kitchen remodel, click on the photo below. Randall Omoto, designer at Homeowners Design Center, explains that, “Many townhouses and condominiums are built this way, where there is a wall that separates the kitchen from the living room, and what (the couple) wanted was just to be able to have an open space, so this is what we ended up creating for them.” Omoto says this is a very common issue he faces with townhouse and condo owners with galley kitchens, which leads them toward a kitchen remodel with an open-concept feel within their homes. “Many times, especially in townhouses, there is a sense that there are two small rooms instead of one big room, and because space is limited in the living room, it’s a chance for them to (make it) feel like it’s a really expansive space,” he shares. A peg board system is used for the deep drawers to create even more space in the expansive kitchen design. The use of roll-out trays was another innovative way of creating storage space in the kitchen remodel, providing more space for the kitchen. Cherry wood was used for a less “woody” look for the cabinets from Canyon Creek. Silestone quartz countertops complemented nicely with the warm look of the cherry wood cabinets. The kitchen remodel went with Silestone quartz countertops from Cosentino, with a lovely neutral color called Amarillo Palmera, because it’s a very versatile material and needs very little maintenance, making it a perfect fit for those people that don’t want to be a slave to their kitchen. The homeowners selected GE Profile appliances. “They wanted everything to match, so we chose (the) GE Profile (brand), as the couple wanted all appliances to match; the refrigerator, an over the range micro-hood combo and a range,” explains Omoto. The numerous canned and under-cabinet lighting bathed the entire space in a welcoming glow. 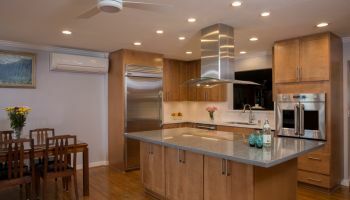 By rounding out the kitchen remodel with the addition of canned and slimmer profile LED task lighting, HDC was able to literally shed light on this couple’s dreams, making their desired open-concept townhouse a reality. To see more projects by Homeowners Design Center, or to find out how they can help you with your kitchen remodel, just click on any of the photos above or wherever you see the company name or “HDC”.